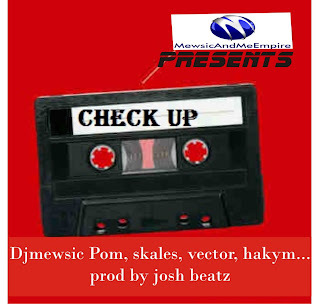 VECTOR, SKALES & HAKYM THE DREAM LINK UP ON DJ MEWSIC POM'S FRESH DEBUT SINGLE "CHECK UP"
Brila FM's in-house DJ, DJ Mewsic comes through with his very impressive official debut single featuring an array of the best of the best in new Nigerian music for 2012 with rising E.M.E rap star Skales trading hard-hitting bars and lyrics with prolific rap newcomer Vector - verse for verse - over this excellent Josh Beatz-produced musical milieu and Hakym The Dream blessing this song with an vocal performance on the chorus to round up a very sublime showing from three of the finest young and new Nigerian artists on this brand new DJ Mewsic POM jam. Nigerian Disk Jockey, DJ MEWSIC - real name, Ojedokun Emmanuel Oluwafemi - also known as "The Crowned Prince Of Mixes (POM)" has always been smooth, accurate and intelligent on the One's and Two's. A student of Mass Communications at LASU, the second child in the family of four became a Disc Jockey in 2001 and consistently grafted his way up to now currently working with one of leading radio station in Lagos, Nigeria (Sports Radio 88.9 Brila FM) as the station's in-house Radio DJ - a position he has held down for close to four years. Also a member of the hottest coalition of Nigeria DJ’s across the globe, Naija DJs, DJ Mewsic garnered the name "Mewsic" from his absolute love for music while his unique skills as a disk jockey and his blend of tunes earned him the title of Prince of Mixes (POM). "Check Up" which features an array of some of the best new artists in Nigeria - Vector, Skales and Hakym The Dream - is the first official single from DJ Mewsic.